The first of two Kotei this weekend is in Cork, Ireland. This is always a fun event that is popular with the European players due to the great social life. The recent changes to the restricted list have really shaken up the environment. 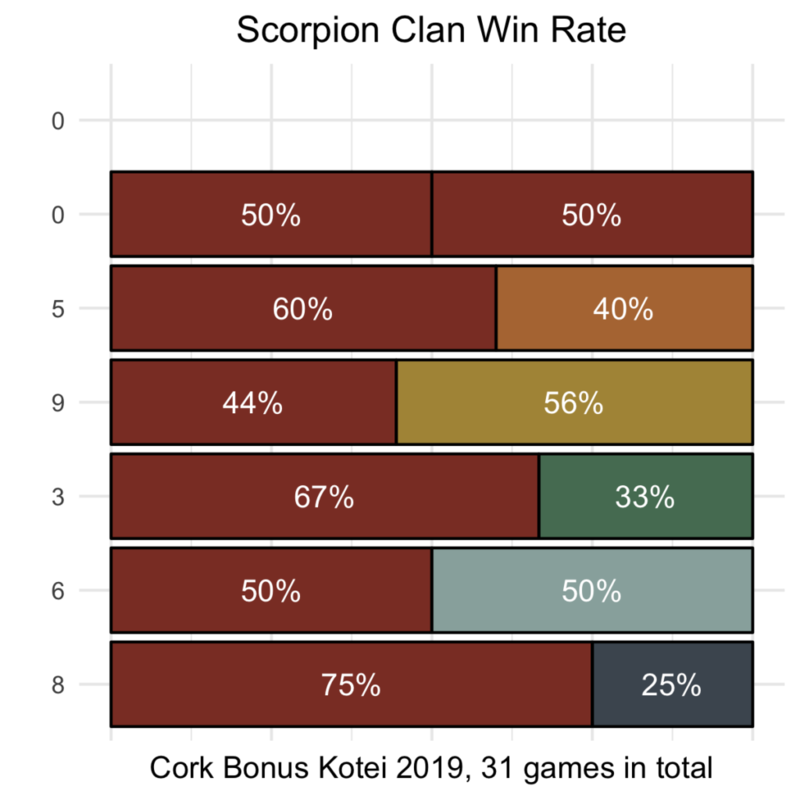 In this event, Scorpion are the least represented clan behind even Lion and Unicorn. 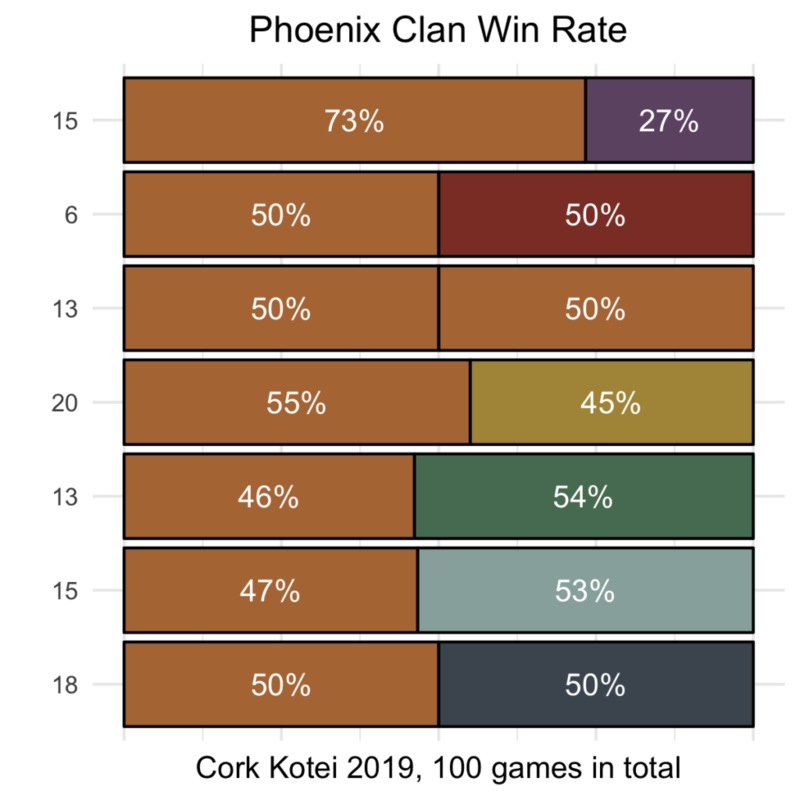 The removal of Against the Waves from the restricted list clearly has pushed Phoenix up to a top tier position. It’s interesting to note that this shift is purely due to the restricted list and nothing else. 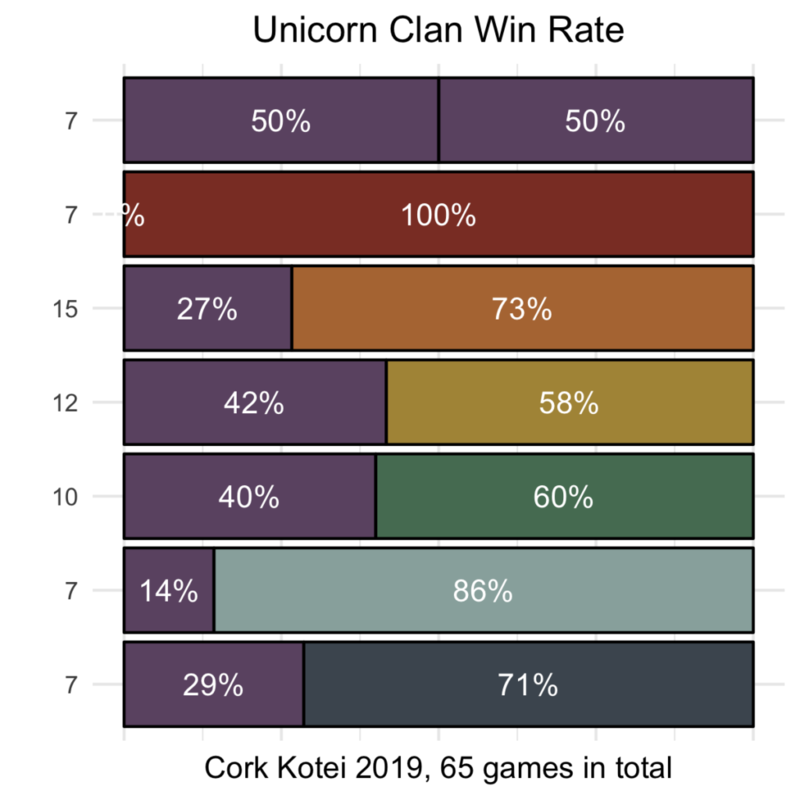 Crab continue the trend of having primarily Unicorn which was played by 9 out of the 13 players. 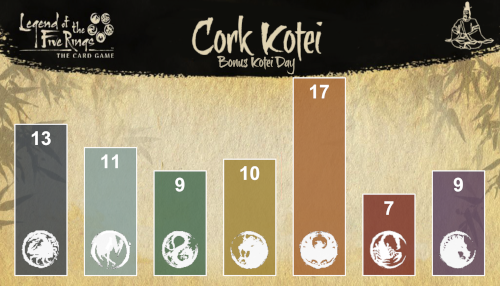 Crane had a great spread with the top two most popular Dragon and Scorpion at 4 each. 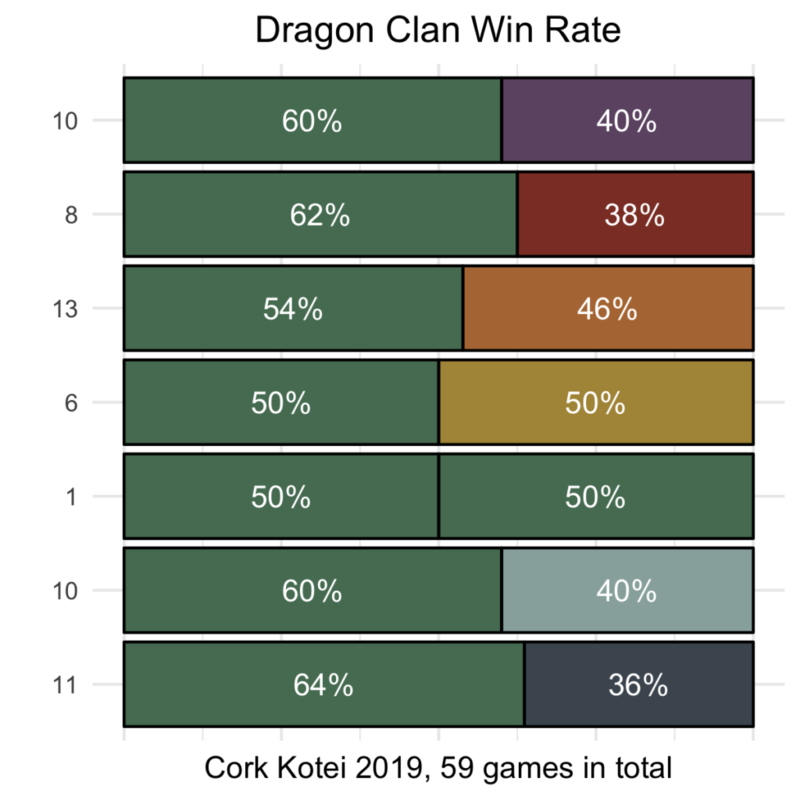 Dragon heavily the Crab splash with 6 of the 10. 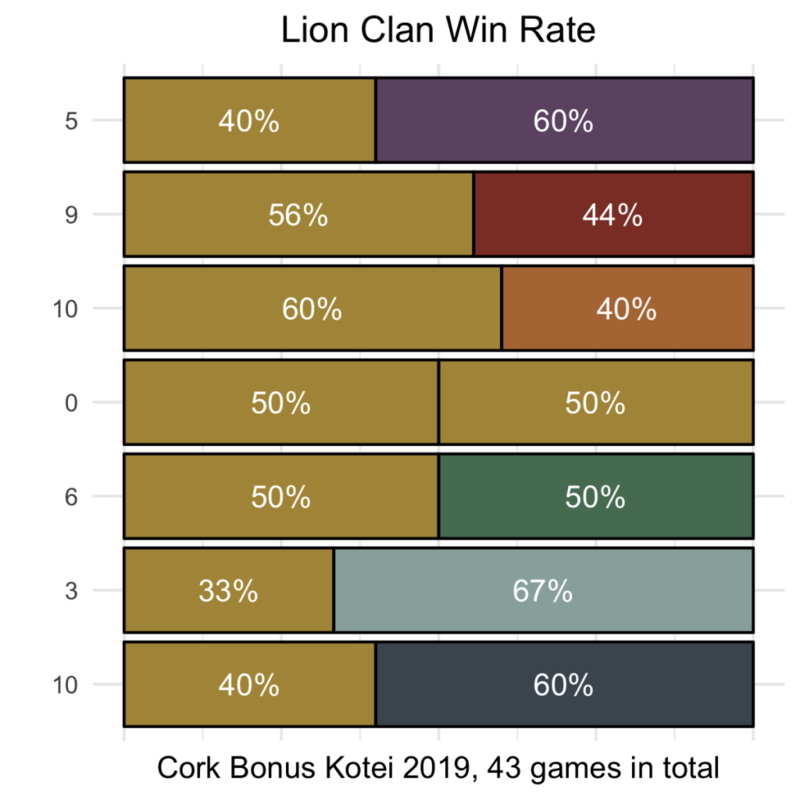 Lion favored Crane, with 6, but the top Lion player was playing Scorpion. 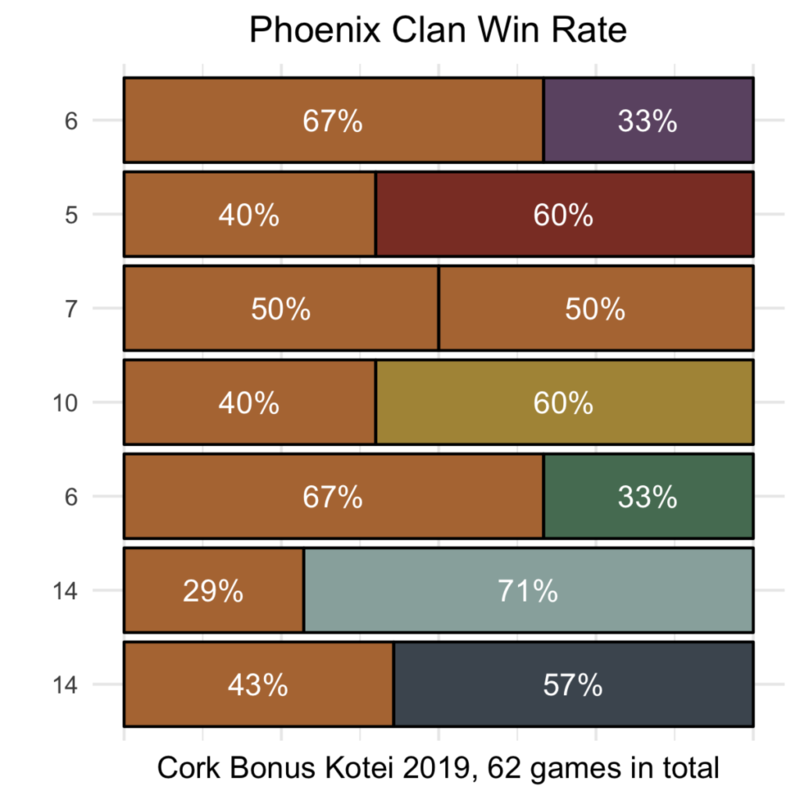 Phoenix primarily splashed Dragon at 9 but Crane also had a decent appearance with 5. Scorpion focused on Crane with 4. Unicorn were predomintently Phoenix splash with a total of 9. At the end of the day, 10 players in total made the 51 points cut. 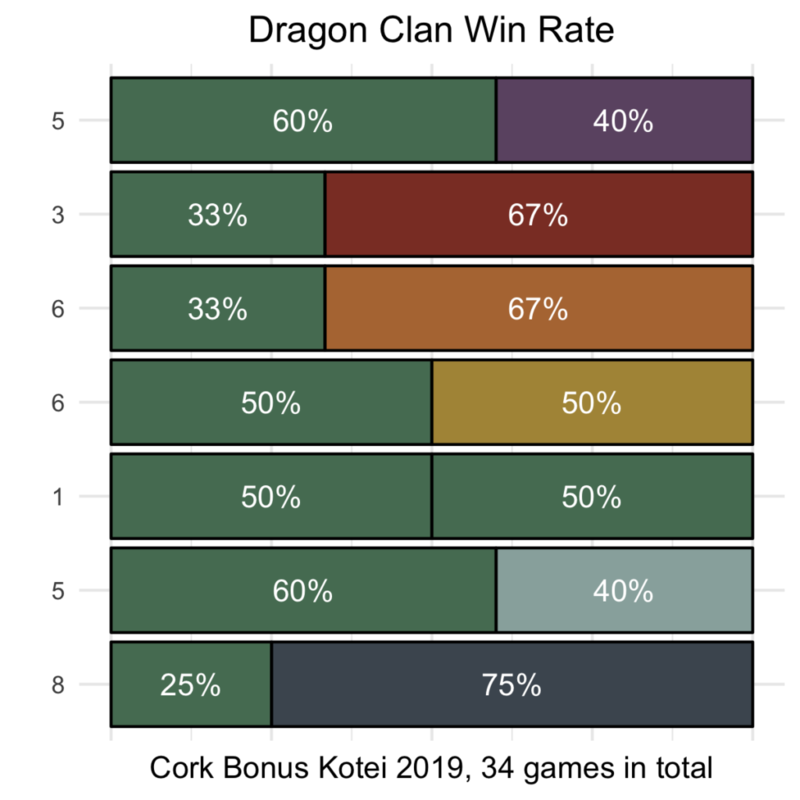 Although Phoenix managed to get the most players qualified, it was actually Dragon with the best qualification rate with 30 of players who entered making day 2. Some fun stuff in the win rates, obviously everything needs to be taken with a grain of salt and there are many factors that we intuit from straight win rates. 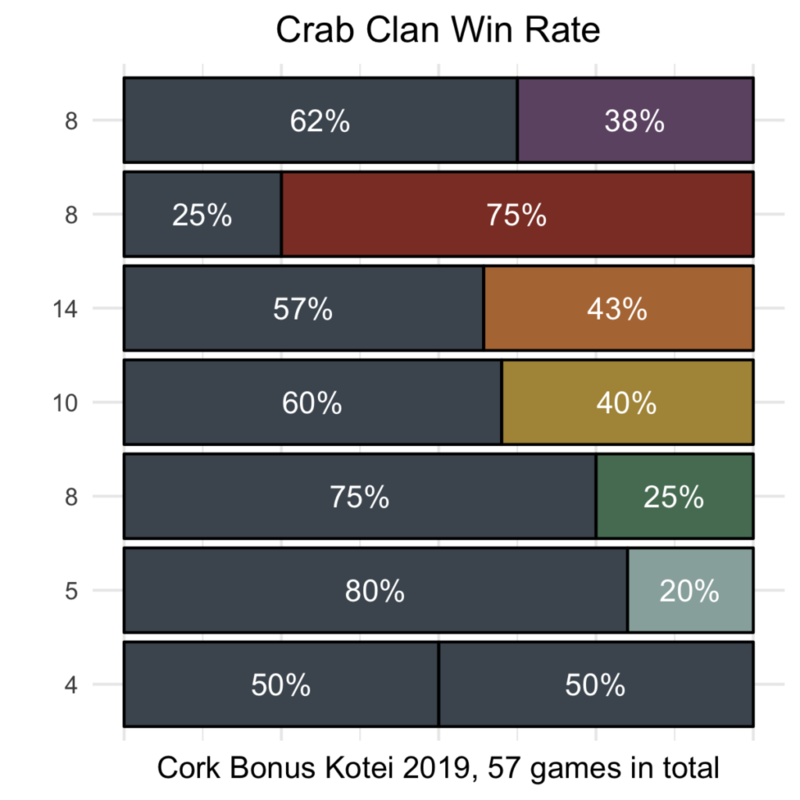 Crab are very weak to Scorpion, Lion, and Dragon. 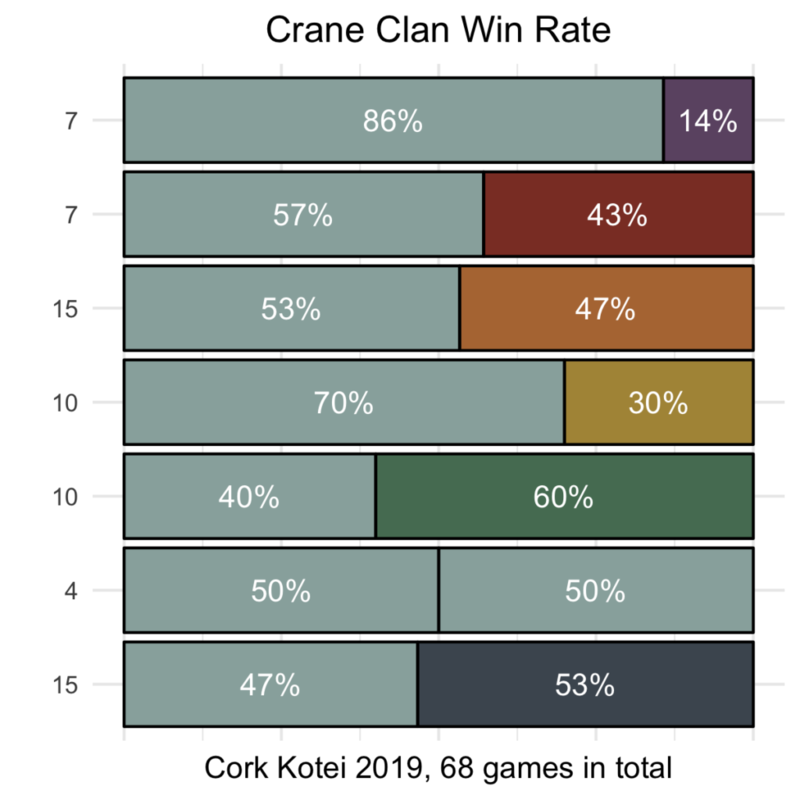 Crane are weak to Dragon. Lion are weak to Crane. Phoenix have no weakness but have worse matchups that Dragon. 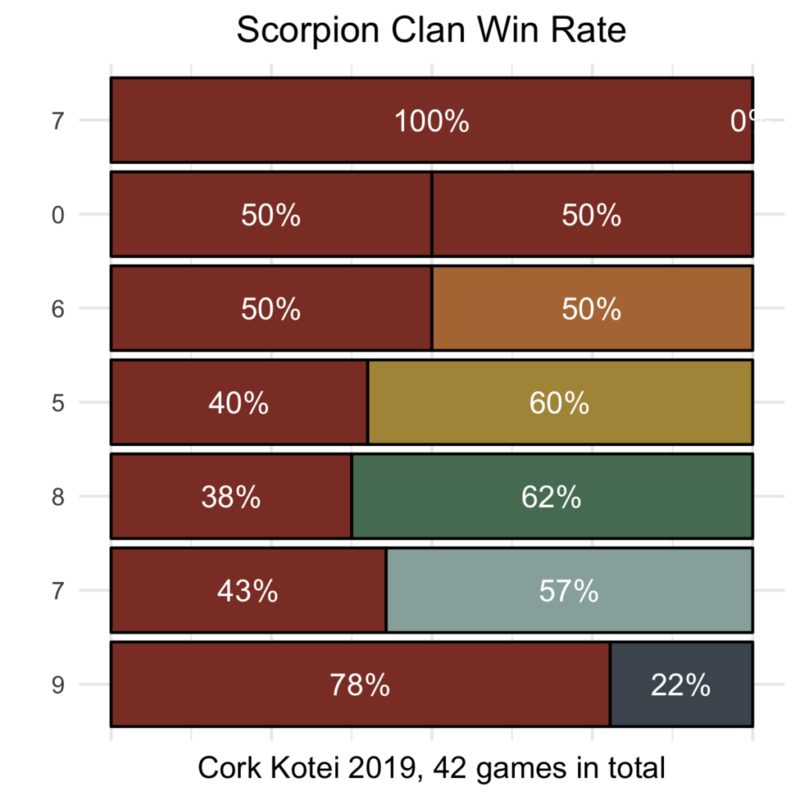 Scorpion are looking weak to Lion, Dragon, and Crane. Unicorn despite the recent optimism are looking pretty weak across the board. At the end of day 1 we have 10 players going into the next day. We’ll see those players in the single elim rounds tomorrow. There are also 7 new Hatamoto. We also have a second day of events which can be found here. It had 72 players, which is a healthy number. As players dropped out of the top cut they would have joined with some byes. 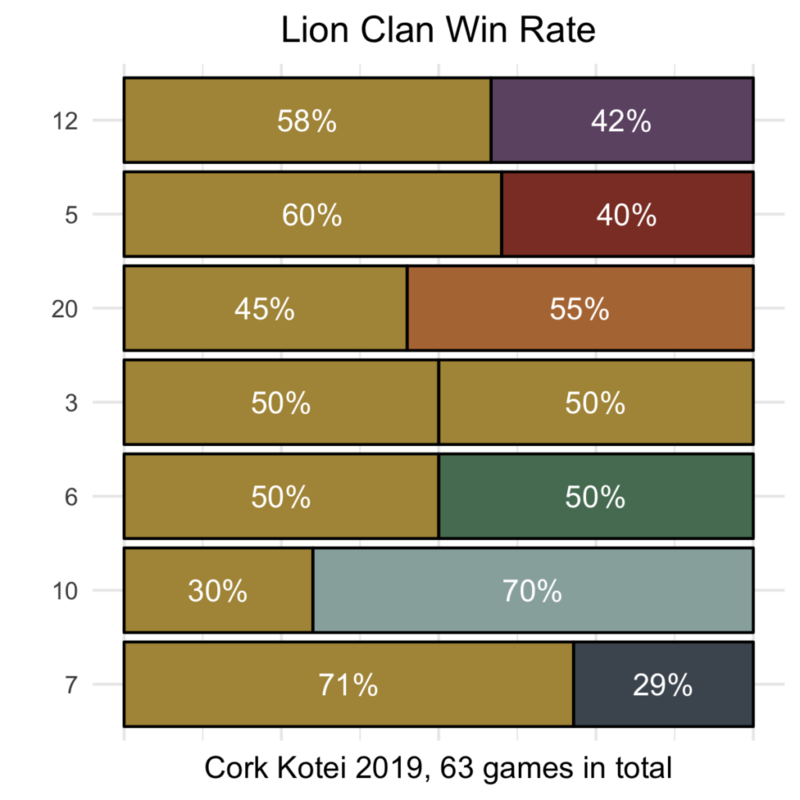 This was only for koku and fun, so final standings are less important than actual games. Obviously fewer games played in the second day than the first. 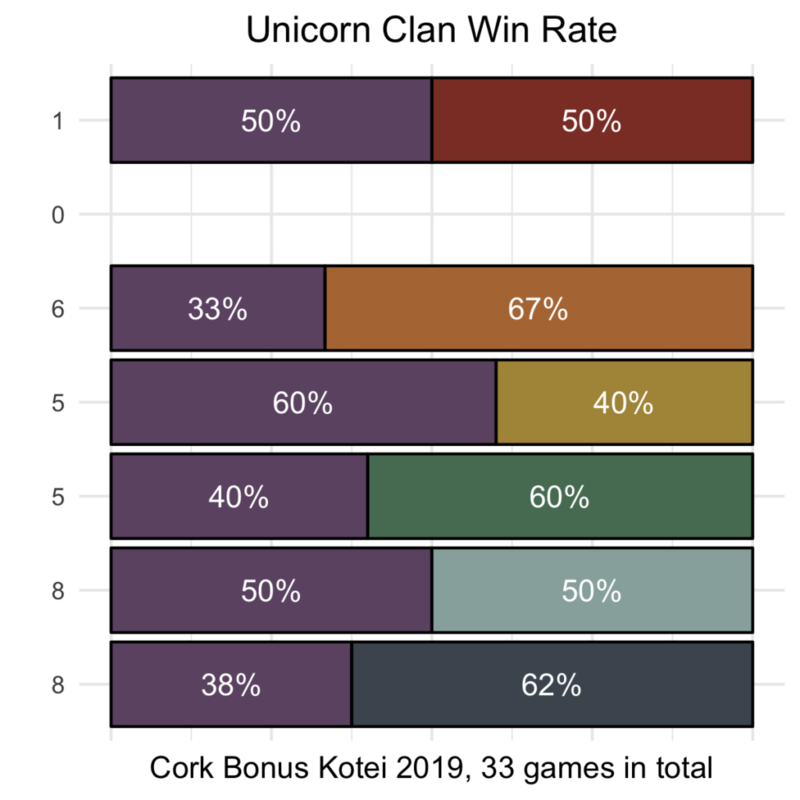 Scorpion and Unicorn completely dodged each other ending up glitching parts of my charts! Day 2 bracket can be found here. 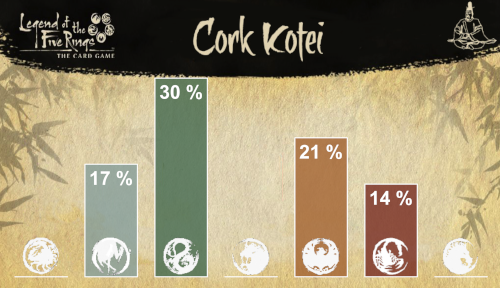 At the end of day two the winner of the Cork Kotei is Jose Luis Saenz. The second place player Javier Querol also made Hatamoto for Dragon. If you have any comments or feedback please post them in the comments section below. 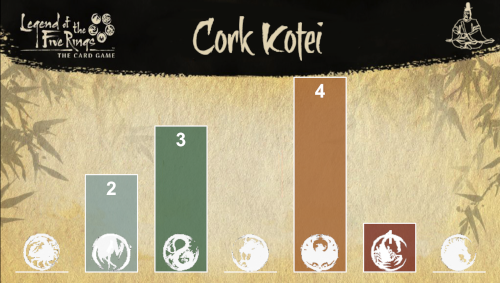 Check us out on the Imperial Advisor website, podcast, and YouTube channel for more discussion about the L5R LCG. 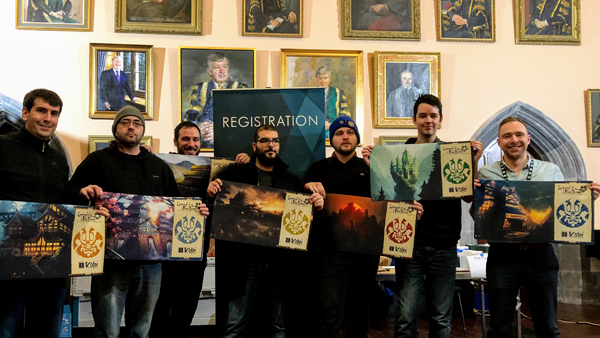 This was by far the most well organised event in the most beautiful location with the most awesome players I have ever been to for any game. Like by kaiu wall long. 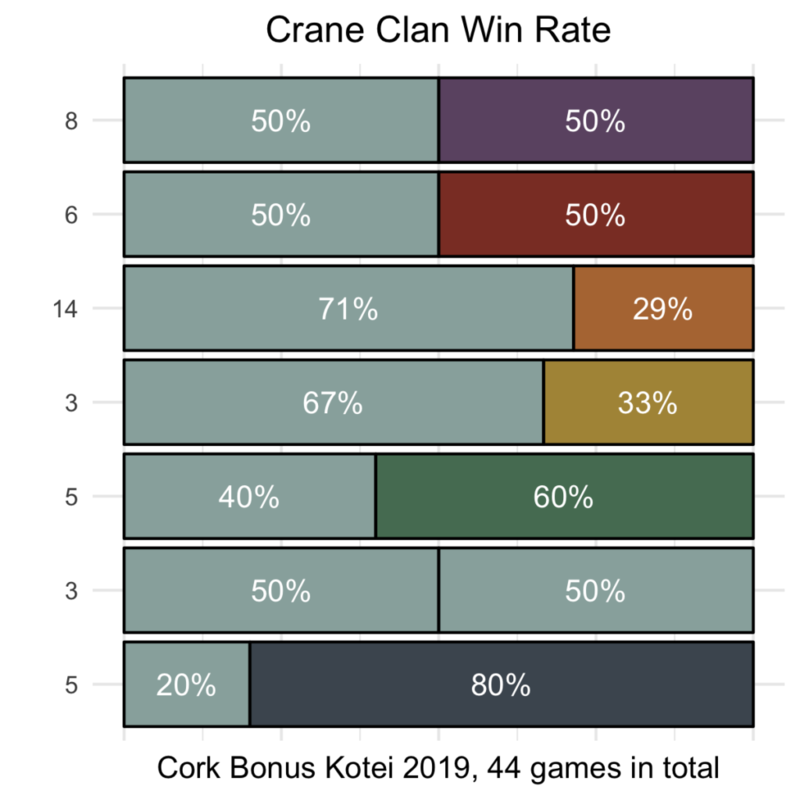 Big thanks to everyone I played with (having a tight fun loss against a London crane, getting chocolate out of my first loss against dragon and getting tips to spend the second day around cork (Ring of Kerry <3) from Bazleebub for the ireland experience – to just mention the losses) if there is a 2020 kotei I will def. be there. How can one not? Thanks for the kind words, glad you enjoyed it.